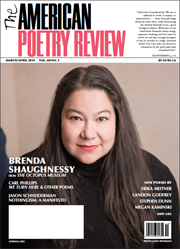 The American Poetry Review is dedicated to reaching a worldwide audience with a diverse array of the best contemporary poetry and literary prose. APR also aims to expand the audience interested in poetry and literature, and to provide authors, especially poets, with a far-reaching forum in which to present their work. The American Poetry Review was founded in 1972 in Philadelphia. By developing efficient, inexpensive production methods and a distribution network that combined newsstands, bookstores, and subscriptions, it became the most widely circulated poetry magazine in the U.S. within the first five years of publication. In the 1970’s, APR established a reputation for publishing a broad range of material: interviews, literary essays and essays on social issues, translations, fiction, reviews, and poetry by the most distinguished authors, by writers working in new forms of contemporary literature, by younger poets now at the center of American poetry, and by writers from other cultures. APR has been published continuously and without interruption since 1972, and has included the work of over 3,000 writers.